mELTing Activities, Lessons and Ideas: Why can't I text during class!?! Why can't I text during class!?! 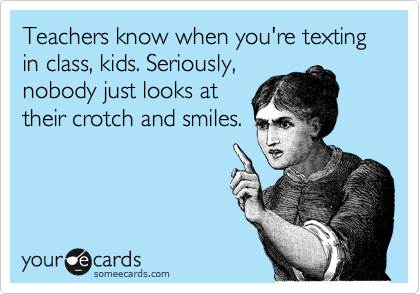 I, like many teachers, have a policy of no texting during class. It isn't because I am evil or cruel but because I find students cannot pay attention to class (especially one in a second language) as well as they think they can. Now, a lot of this can be prevented by making classes more dynamic and interactive, but then they should still be listening to their partner/classmates to properly interact (and not texting). Yes, I am from a generation of multitaskers, and my students even moreso. However we still have to deal with the fact that we are not able to do as much as we would like. Well first of all something that some call inattentional blindness. Have you ever taken the awareness test? I highly suggest showing one, or both in class at the beginning to reinforce your rules. Basically the premise is that if you are only paying attention to one thing you tend to focus on that and ignore other information that could be helpful. It is a useful skill we have picked up. When driving you don't need to feel every inch of fabric on you, hear every beat of every song or read every license plate of every car on the freeway. You wouldn't be able to focus on driving. Nonetheless, when you are in class even if you are 100% focused, you may still miss out on some essentials. Moreso if you divide your attention between your phone and your class. And even more when your brain is doing a task in one language (texting your friend in Spanish) and another in a weaker language (quasi-listening to your teacher in English). Here's another activity. Have you ever noticed how students frantically write down whatever you put on the board to the point they don't hear what you say? Don't do this with lower level classes, but with higher level classes write a ridiculous and irrelevant sentence on the board. If you are reviewing participle phrases put, "George Washington had a pink dog." The sentence is 1. inaccurate 2. has nothing to do with participle phrases. Before you write it on the board let them know this is a test. You just want to see who is paying attention. Tell them NOT to copy down the sentence. As you are writing it repeat, "DO NOT WRITE THIS DOWN." At the end of the day collect their notes and see how many students wrote the sentence. So, I don't want my students to halfheartedly listen to me (and their classmates) and not actually listen. OK...but that isn't all. People are also losing the ability to listen!I love showing my student's Julian Treasure when he talks about listening. In essense he talks about how people listen, what problems we have listening and how it effects us. Similar to inattentional blindness we are already learning to tune out things and our brain struggles to follow two things at once (listening to the radio, a friend and a movie). Think about it. When you are driving, how often do you turn the volume down on the radio when you are looking for an address. The radio has no effect on your vision, but it helps you focus! The same with texting. What do you think? Should students be allowed to text in class?